"This protein-rich side dish is loaded with flavor and quick to prepare! Nutritious GOYA® Organic Quinoa is simmered beautifully with recaíto and orange juice. 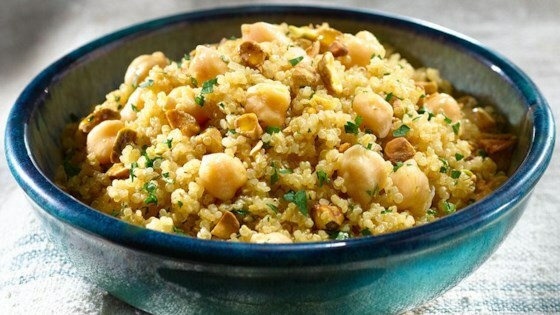 Then, plump and nutty GOYA® Chick Peas are stirred in, along with fresh mint, parsley and hazelnuts. Enjoy this delicious medley of fresh spring tastes!" Combine oil, Recaito, quinoa, orange juice, salt and 3/4 cup water to boil. Simmer covered over medium-low heat, until liquid is absorbed and quinoa is tender, 20 minutes. Stir in chick peas. Remove from heat and let stand, covered, for 5 minutes. Stir in mint, parsley and hazelnuts. This recipe had good flavor and made a nice side dish to a spicy sandwich. I added 1 cup of water to cook the quinoa, as the OJ would not have been enough liquid by itself.